“The market environment is likely to get tougher in February and March as investors wrestle with the impact of fiscal tightening on the economy,” said Russ Koesterich, BlackRock’s global chief investment strategist. There are a number of factors at play, including signs of improvement in Europe and sustained growth in China. 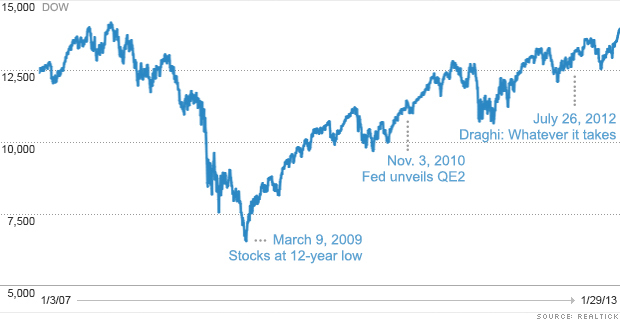 But analysts say the Federal Reserve’s stimulus moves have been the main driver. The bond-buying strategy, now in its third iteration, has coincided with a broad improvement in economic data and record profits for U.S. corporations. But the rally is as much about what did not happen as what did. And the Chinese economy appears headed for a soft landing, easing worries about demand in the world’s second largest economy. “Together, these things basically assured a risk-on rally,” said Quincy Krosby, market strategist with Prudential Financial. Investors were also drawn back into the market by attractive valuations, which is a fancy way of saying stocks are cheap. Since the market bottomed in 2009, many large investors have been scooping up shares of companies that were beaten down in 2008. Many bank stocks, for example, were trading well below book value, which is the theoretical price their assets are worth minus their liabilities. Bank of America (BAC, Fortune 500) more than doubled in price last year as investors flocked to shares of companies in the financial services sector. JPMorgan Chase (JPM, Fortune 500), Goldman Sachs (GS, Fortune 500) and Morgan Stanley (MS, Fortune 500) also bounced back. But the trends that have supported stocks up until now are changing, and investors should be prepared to play defense, said Doug Cote, chief market strategist at ING Investment Management. Cote pointed to corporate earnings, the life blood of stock returns, which are not growing as much as they had been. Cote said the increased participation by individual investors is “a good thing,” since they had been underexposed. But he warned that the market could be headed for a pullback. “I think this thing comes back to Earth a lot faster than it went up,” he said.